To set the scene, Figure 1 shows the long-term decline in real interest rates since the late 1980s – a fall of around 450bps. The decline in real rates has occurred across countries, largely against a backdrop of low and stable inflation. This suggests that structural factors may be responsible for the fall and implies that the global neutral rate (which acts as a long-term anchor for individual countries’ equilibrium rates) may also have fallen. Our aim is to identify which structural factors could have caused the decline, to quantify their effects, and discuss how likely they are to persist. One of the most frequently cited drivers of changes in real interest rates is changes in trend growth, so can a growth slowdown explain much of the fall in global real rates? 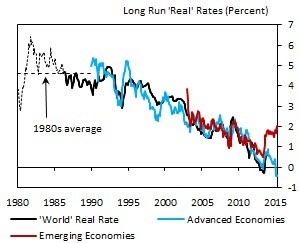 Before focusing on recent trends in global growth it is worth dwelling on how changes in growth translate to changes in real rates. Often we assume a simple one-to-one mapping where changes in growth affect the rate of return on capital and hence real rates. But the mapping is actually quite uncertain. Structural models offer a nuanced view. 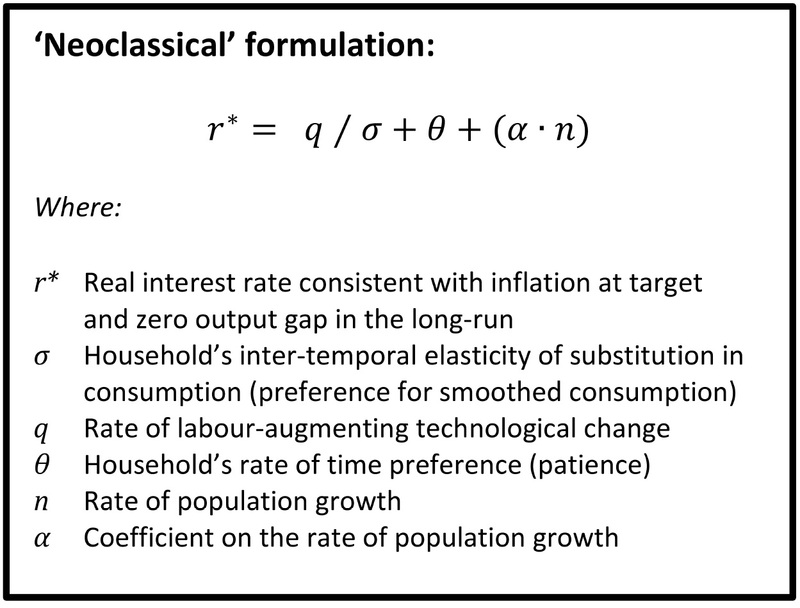 In the neo-classical model real rates depend on time preferences, the pace of technological progress and, in some formulations, population growth (Figure 2). The preference parameters are particularly noteworthy as they modify the link between growth and real rates. Estimates of these parameters are difficult to obtain, but one meta-study by Havranek et al. (2015) suggests the global average for σ (household preferences for smoothed consumption) could be around 0.5. That implies the mapping between productivity growth and real rates may not be one-for-one, but potentially one-for-two i.e. a 1pp fall in productivity growth could lead to a 2pp fall in real rates. Even with multipliers greater than one it is difficult to account for much (if any) of the pre-crisis fall in real rates by just appealing to past changes in growth. Global growth was fairly steady in the pre-crisis decades – averaging 3 to 4% per year – so other factors must have driven the decline in rates before the crisis (a point we will return to in Part 2). However, the crisis itself may have triggered a broader reassessment of trend growth prospects going forward, perhaps linked to the secular stagnation debate. Greater pessimism about future growth could be playing an important role in driving the decline in real rates we have seen most recently. 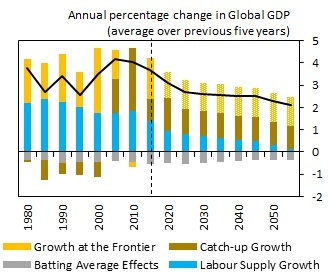 Broadly speaking there are three factors that might lead trend growth to weaken over the future: 1) a reduction in labour supply growth; 2) a slower-rate of catch-up in emerging markets; and 3) weaker growth at the technological frontier. So how pessimistic should we be about each? Labour Supply: Growth in global labour supply peaked at just over 2% in the 1980s as the demographic dividend from the post-war baby boom (and falling mortality rates in EMEs) fed through to the labour market. Since then, the pace of labour force growth has slowed by a third. 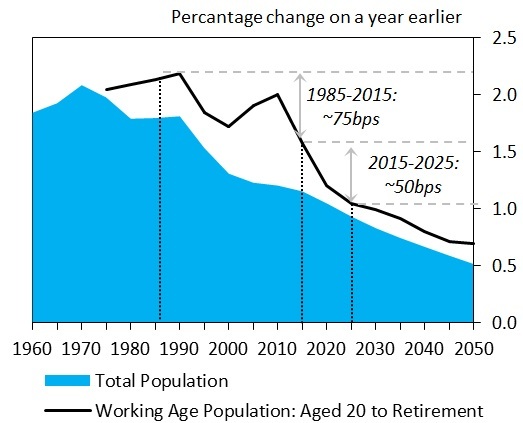 The structure of the population means further falls are largely baked in the cake: global population growth slowed sharply in the mid-1990s and that effect is now feeding through to labour supply (Figure 3). This effect could directly reduce global growth by around 0.5pp over the next decade. The mapping from labour force growth to real rates is particularly uncertain given many structural models exclude this component entirely (α in Figure 2). If we assumed a one-to-one mapping, it would suggest expectations of slower labour force growth could account for up to 50bps of the fall in real rates we have seen, though in reality probably less. Slower labour supply growth could also have wider effects on growth and real rates via productivity spillovers – boosting productivity by alleviating resource constraints or reducing productivity by reducing the returns to innovation. Given the effect can go both ways, we do not explicitly account for these spillovers here. Catch-Up Growth: Offsetting the decline in labour supply growth has been a sharp pickup in the rate of catch-up, particularly among Asian Emerging Market Economies (Figure 4). For this trend to continue, EMEs will need to overcome the middle income trap and avoid geopolitical strife. Historical evidence is mixed as to whether this will occur – the rapid growth of EMEs early this century provides reason for optimism, while the more recent slowdown and concerns about the build of emerging market debt gives reason for pause. We assume the pace of catch-up going forward is not as fast as the late-2000s, but not as slow as it was in the 1990s either. This neutral assumption means we don’t pin the decline in real rates on a further slowdown in the pace of catch-up, though clearly this judgement is open to debate. 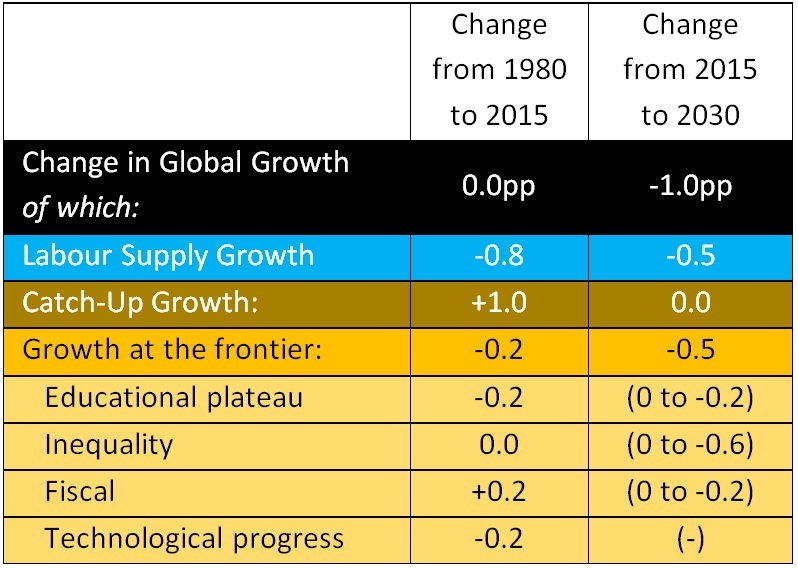 Growth at the technological frontier: The other driver of global trend growth is the pace of growth at the technological frontier (proxied by the US). Robert Gordon has championed the view that several structural headwinds will hold back US growth in the future, including: further falls in the pace of educational attainment; rising inequality; and fiscal drag. Gordon suggests these factors could drag down trend growth at the frontier by up to 1pp – either by directly affecting the supply side or via demand effects leading to hysteresis. Having interrogated his analysis, we accept the argument on the educational plateau – the number of years of schooling per worker cannot go on rising forever and has already started to slow. Moreover, Gordon’s figures are backed up by others e.g. Jorgenson & Vu (2010). But we are less convinced by the headwinds from inequality and fiscal policy given uncertainties over fiscal multipliers and the overlap between the inequality and education arguments (rising inequality makes it more difficult for poorer households to afford college). Overall, we judge that growth at the frontier could be 0.5pp weaker in the decade ahead due to these headwinds. If we assume a generous mapping of one-to-two between productivity growth and real rates, these headwinds could account for up to 100bps of the fall in real rates we have seen (though probably a little less). The other major uncertainty is over the pace of innovation. 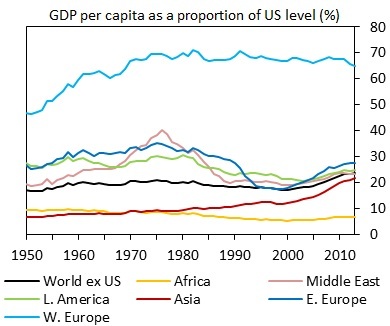 Gordon argues that the recent weakness in US productivity growth is a longer-lived phenomenon stretching back to the 1970s and hence will continue going forward. Others, such as McAfee and Brynjolfsson, see the recent slowdown as a blip – growing pains as a result of disruptive new digital technologies that will soon give way to rapid productivity gains. Gordon’s view seems the more compelling for now, particularly given the recent weakness in productivity globally. But developments could change quickly suggesting substantial upside risks in the medium term. For now, our estimates assume no further decline in TFP growth relative to the past five years, but no acceleration either. Lukasz Rachel works in the Bank’s International Surveillance Division and Thomas Smith works in the Bank’s International Directorate. Previous Post Are firms ever going to empty their war chests? Next Post Drivers of long-term global interest rates – can changes in desired savings and investment explain the fall?